Remember how in the late 1990s/early 2000s the Medieval Warm Period (MWP) was made to disappear, and it was claimed that it was mainly a local, North Atlantic phenomenon. Unfortunately for those trumpeting this claim, a comprehensive worldwide survey of scientific literature is now showing that the MWP was in fact a global phenomenon, suggesting large-scale natural cycles are what is really driving the climate. The plotting of the Medieval Warm Period Map is making good progress. At first the basic idea was the Southern Hemisphere because of the notion that Medieval Warm Period (MWP) could be limited only to the Northern Hemisphere, mainly the North Atlantic, kept popping up. The collection of data for Africa, Antarctica, Australian and Oceania is now finished and it shows that the MWP was prominent. In South America the data have been recorded foremost in the northwest part. The rest will soon follow. The online data chart is here. The color code is as follows: red = warm MWP, blue = cold MWP, yellow = dry, green = wet. Here the precipitation code is shown only when there is no temperature information. Over the last weeks the charting has been focused on the Mediterranean region, Arabia and the Caspian Sea. Once these regions are finished, the focus will move to northwards into Europe. Within the scope of the Environment Conference in Paris in April 2016, French Minister of Environment, Energy and Ocean Issues Ségolène Royal started an Internet platform that has the aim of promoting the 100 most innovative citizens’ initiatives for climate. 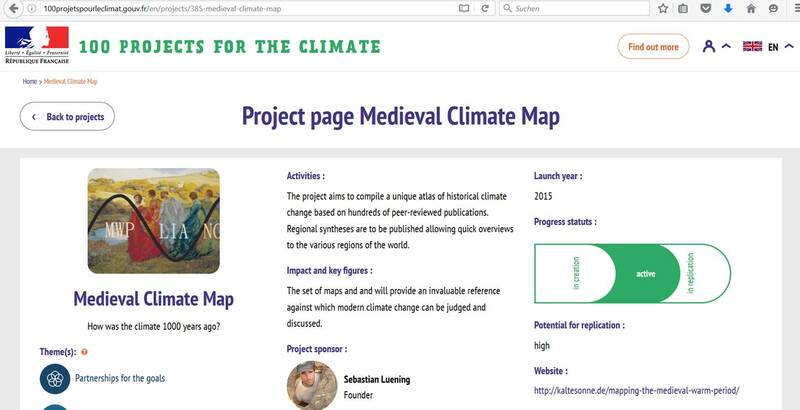 Among the candidtes is also our Medieval Climate Map, which is now an officially electable project. From June 6 to July 6 it will be possible for citizens to vote for their favorites. After the voting by Internet users ends, the top 100 will be declared as the winners by Ms. Royal. These will be supported and promoted until COP22 in November in Marrakesh. We hope you’ll support us with your vote when the voting opens. We’ll remind you at our blog, of course. The MWP project is 50% funded, thanks to your generous support. More information on the MWP charting map is available here. I registered. Then I tried to vote. Without a success up to now. I will try again tomorrow. You can choose ten projects. You can give two votes for your favourite project. Many of those projects are stupid. I found a couple of Haitian project for which a vote may help. Here’s a good report from the National Park Service. The Retreat of Alaska’s Exit Glacier (Harding Ice field). On the last page (6 of 6) is a wonderfully clear understanding of how far the glacier had retreated during the MWP – while forests were thriving at high elevations – then how some 700-800 years ago – the glacier started advancing once again, mowing down the trees (which they’ve carbon dated. Perhaps if we stay this warm for another 100+ years, the trees can once again take root and grow to maturity. Obama visited here in the fall of 2015 – but didn’t bother to get educated on the history of the glacier, before he opened his mouth . bla bla.